Ladybugs, ladybirds, or lady beetles are a family over over 5,000 species. They display some variation in form and function, but almost all are small, voracious eaters. In fact, their ability to devour many plant-eating insects is what makes them a farmer's best friend. Ladybugs are between 0.3 and 0.4 inches in length. While born black, their adult coloring can range from yellow to scarlet and the spots present on their half-sphere shaped elytra (wing coverings), vary as well. Their coloring is quite memorable to predators and, thus, used as a defense mechanism. Should that not dissuade a predator, ladybugs also secrete a foul-smelling liquid from their legs. For sensory perception, ladybugs sport antennae and eyes on a head that can be drawn back into the pronotum (protective casing anterior to the elytra). The wings protruding from the elytra are extremely thin and light, beating 85 times per second if necessary. Four stages exist in the ladybug life cycle – a process known as complete metamorphosis. As ladybugs feast on aphids and other plant-eating insects, following sexual mating, females deposit up to 300 fertilized eggs among these plants. After 2 to 5 days, newly hatched larvae have an immediate feeding source for the 3 weeks they remain in this stage. After bulking up on aphids, larvae enter a resting stage as pupae. Following a week of this growth process, the adult ladybug emerges, fully formed and ready to keep eating. The lifespan of these beetles generally is between two and three years. Ladybugs originated in Europe and Asia, but due to their usefulness at controlling aphid populations, they have been introduced to Britain, Ireland, and North America. They can be found almost anywhere aphids and temperate conditions are. This includes small plants, shrubs, trees, or gardens. As they don't fare as well in cold winters – and prey dwindles – ladybugs overwinter in protected areas, such as caves, boulders, or dense foliage, living off stored fat. 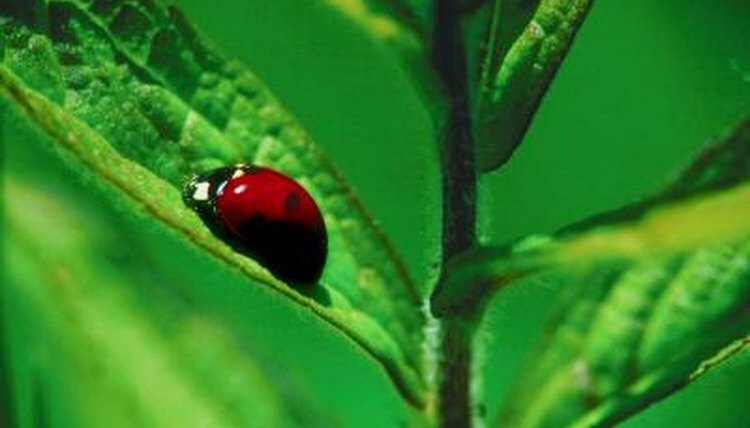 As cold-blooded species, ladybugs mainly are diurnal, utilizing as much sunlight as possible for feeding and mating. For this reason and for protection, ladybugs will form aggregate communities of up to 15 individuals for the overwintering period. They find protected areas of dense foliage, giving off chemical cues to attract other individuals to the area. Not only does overwintering in a large group help protect them from predation, but it allows them to “wake up” in the springtime next to many potential mates. Ladybugs also use chemical cues to notify others of prey and, when in the larval stage, will give off an intraspecies repellent so the adult ladybugs won't eat them during times of reduced aphid availability.